This is not a recent image. The galaxy here is the famous, M63 or Sunflower Galaxy. Since most night sky objects are very very dim; astroimagers expose their camera with the starry photons for minutes or even hours (if the sky permits). While imaging M63 at 5 minutes of single exposure, here came the image.. a satellite had just passed right through the center of the galaxy! Of course the satellite was in the foreground and the galaxy is way way too far from us. Now that’s an interesting image! Few years back, i went to Nathia Gali and took my DSLR, Canon 6D with me. 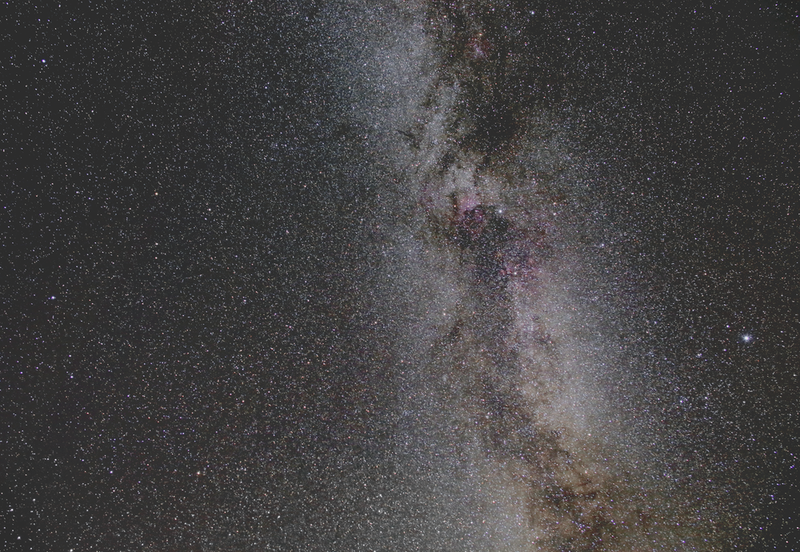 I had recently purchased Rokinon 24mm lens which can operate at f/1.4 and also has a lens to correct spherical aberration.. a great lens for wide field low light imaging tasks, namely our own galaxy Milky Way. Above is a stack of multiple 30 seconds exposures. I had just put the DSLR on a chair and lens was looking straight up in the sky and this is what it saw. Of course this image has gone through Photoshop.. we cant live without PS can we! All the colors are true in this image.. just enhanced a bit.